Solid Eavestrough has been providing dependable gutter, downspout and extension installation, repairs and cleaning services in Toronto and the GTA for over 15 years. We have the skill, knowledge and expertise to resolve any gutter or eavestrough concerns. 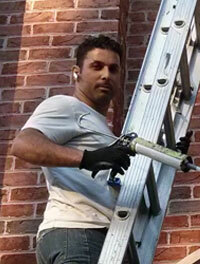 Solid Eavestrough provides services to residential, business and industrial clientele in the Toronto area. Our gutter cleaning services remove all debris from your gutters and downspouts. As part of our A-one service we perform a complete downspout flush when needed. Unlike some other services we clean up any debris around the house that has fallen during our Gutter cleaning. At Solid Eavestrough we are constantly learning to improve our service for our customers. We will install Gutter Guards for those customers that want to do away with the hassle of gutter cleaning. For repairs Solid Eavestrough is number one. We take the time to truly listen to your needs and respond to in a skillful, professional manner. At Solid Eavestrough the client comes first! Allow me to introduce myself, my name is Yaron Sombul. I am a long time resident of Toronto and I care about our residents. Yaron and Tip Top is the way to go. Honest, fair, reliable, and careful. I’ve used Yaron for years. Today when he came, Yaron assessed exactly what I needed and Jay did a great job executing his instructions. Such a pleasure to know I can rely on a contractor! I wish he did electrical, plumbing, masonry, and renos…If he did, I’d just use Solid Eavestrough for everything. Yaron was very professional and courteous. He walked us through all that he was going to do and took before/after pictures to show us. What we really appreciated was how communicative he was and how easy he made the whole process. I would 100% trust and recommend Solid Eavestrough.